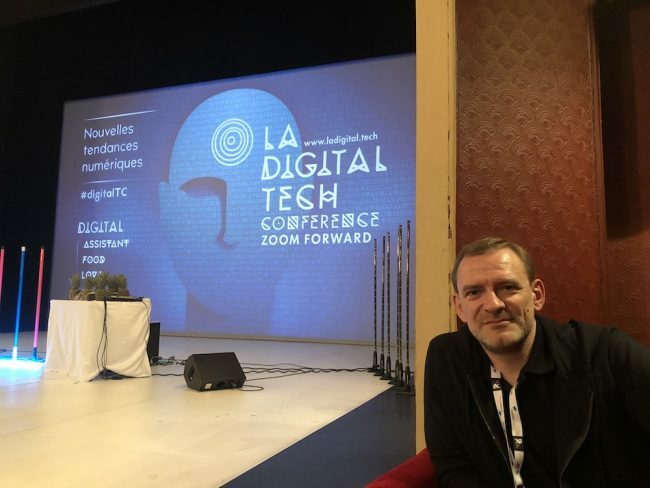 This year’s Digital Tech Conference once again brought together over 600 people on November 30th at the Rennes Opera (France). Amazon, Google, Meetic and Mozilla were among the speakers present at this edition dedicated to voice assistants, food and love tech. For the first time, all of the conferences were bilingual. The 4th La Digital Tech Conference is taking inspiration from common practices to devise the future of agriculture and food in particular. On the menu, expert speakers on safety processes, food, waste reduction, etc. linked to digital technology. Rudy de Waele is a renowned speaker, futurist, humanist, curator and author. He also participated as a speaker in La Digital Tech Conference in 2015. This year, he will be back there again to introduce the three themes for 2018 and to speak about a subject close to his heart: the age of consciousness. Blithely discussing robotics and food in the same breath in Bocuse country where lunch-breaks exceeding 45 minutes are the norm, may well raise eyebrows. Nonetheless, we’re salivating at the thought of hearing Philippe Goldman, CEO of Ekim, talk about robots and pizza dough!